The rebuilding of the Temple (Bet Hamikdash) is an event that we have been awaiting since its destruction, these two thousand years. It is written in the Jerusalem Talmud “each generation in which the Temple is not rebuilt in its days is as it were, that in which it was destroyed “(Tractate Yoma 1:1). Nonetheless our sages (of blessed Memory)saw that in the learning of theLaws and the service of the Temple it is as if it were already standing.even though we do not yet merit its rebuilding . “Scholars who study the laws of the service are considered by Scripture as if the Bet Hamikdash was built in their days “(Babylonian Talmud, Tractate Menachot 111:1).Despite this, there is a great laxity in the study of this subject ,and it is often of limited appeal. For this reason we decided to produce this model of the Temple to draw people to this study and make it easier.Our main intention in the model was to make a design that was both easy to undertand and simple to build. 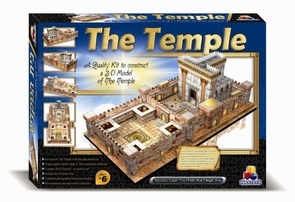 IT IS A NEW AND EXCITICAL MODEL TO BUILD WHICH REQUIRES NO CUTTING OR GLUING AN EDUCATIONAL KIT TO LEARN ABOUT THE SECOND TEMPLE A BOOKLET IS INCLUDED WITH A FULL EXPLANATION ON HOW TOBUILD THE MODEL ,A MAP OF THE TEMPLE AND ITS HISTORICAL BACKGROUND. After Cyrus published his decree in the year 3390 (538 BCE), 52 years after the beginning of the Babylonian exile, more than forty thousand families left Babylon for the Land of Israel. Most of them were from the tribes of Yehuda and Benjamin; including thousands of priests. They were headed by Zerubabel ben Shaltiel the nephew of Yehocin the king, Yehoshua ben Yehutzedek, the nephew of the last of the high priests to serve in the first temple, and the last three prophets Hagai, Zecharia and Malachi. Six months later, in the month of Tishrei, the exiles gathered in Jerusalem and began to build the temple. The Samaritans and others nations that Sennacherib, the king of Assyria, had settled in the Land of Israel, were against the rebuilding of the temple and did everything in their power to stop it. Having failed, they sent a letter to Cyrus “telling” the king that the Jews planned to fortify the walls of Jerusalem and revolt against him after completion of the temple. Cyrus ordered work on the temple to be stopped immediately. Work on the temple was renewed only 18 years later, thus fulfilling the prophets’ prophecy that 70 years would pass from the destruction of the first temple to the completion of the second) The prophets Zacharia and Hagai told the people of Israel that they must continue construction of the temple without asking for permission from the King of Persia. Zerubabbel ben Shaltiel and Yehoshua ben Yehutzedek continued the work of building the Lord’s temple. Hagai the prophet encouraged the builders, strengthening their hearts that they would no be afraid. In those days, the envoy of Darius – the son of King Ahashverosh and Queen Esther and successor to the throne of Persia - was in the land of Israel. He sent a letter to King Darius to clarify matters. A search of the royal archives revealed the license that Cyrus had granted to the Jews to build the temple. King Darius ordered work on the temple to continue; he sent gifts and warned those who would try to interfere with construction of the temple. Work on the temple continued for altogether forty years. When it was completed, the people of Israel celebrated; sacrifices were offered and the work of the temple was commenced with great splendor and fanfare. About a year later Ezra the Scribe and thousands of the people of Israel came to Jerusalem after receiving permission from King Darius, the king of Persia, who had appointed Ezra to head the people of Israel and had granted him the authority to judge anyone who violated the law of Israel. Thirteen years after Ezra came to Jerusalem, the king granted Nehemiah permission to settle in Jerusalem, build a wall and fortifications around the city and place a large military garrison there. Years went by and during the rule of Alexander the Great, who had conquered the Land of Israel, the Kuttim, a tribe settled in Israel by Sennacharib, persuaded Alexander to lay waste to the temple. When Shimon the Just, the High Priest, found out, he put on his priestly garments and, accompanied by trainee priests carrying lanterns, marched all night long to greet Alexander at head of his army. As the two sides approached each other, Alexander saw Shimon Hatzadik at the head of his camp and immediately descended from his chariot and bowed before the high priest. When Alexander’s counselors asked him why he had done so, Alexander told them that in all his battles he had seen the figure of Shimon Hatzadik marching before him. It was thanks to the high priest, Alexander said, that he had won all his battles. The Lord, blessed be He, had shown Alexander the figure of Shimon Hatzadik in order to save the temple from destruction. King Alexander asked the high priest why he had come with a delegation to meet him. Shimon Hatzadik told Alexander that the Kuttim had misled the king and asked him to destroy the temple in which the Jews pray for him and his kingdom. Without hesitation, Alexander the Great gave the Jews permission to take revenge on the Kuttim and destroy their temple of idolatry on Mt Gerizim. Alexander also decided to waiver tax payments for the sabbatical years in order to make it easier for the Jews to uphold their religion. As a gesture of gratitude, all the Jewish boys born that year were named Alexander. In the 179th year of Greek rule in the land of Israel, 213 years after completion of the 2nd temple, Antiochus the 4th came to power. Antiochus had a dream – to spread Hellenic culture throughout the world. Some of the people of Israel adopted Hellenic culture and Antiochus used them to take over the spiritual centers of the land of Israel; Greek influence spread throughout the country. Antiochus imposed his rein on the temple, appointing as high priest the Hellenist Yasson, the brother of Jochanan the high priest. Greek culture seeped into Jerusalem; theaters were founded and the priest’s work in the Lord’s house was affected. Some of the temple vessels were stolen by the Hellenists and sold for large sums of money. Most of the people of Israel remained faithful to G-d and waited for the right moment to throw the high priest Yasson out of Jerusalem. The moment arrived when war broke out between Greece and Egypt; rumors broke out in Jerusalem that Antiochus had been killed. The faithful arose and expelled Yasson, the Hellenist priest from Jerusalem. When Antiochus, who was sorely beaten in his war with Egypt, found out he was furious. He sent troops to Jerusalem, looted the town and the temple and slaughtered many Jews. Antiochus decided to uproot the Jewish religion from the Land of Israel. He decreed laws forbidding the Jews to circumcise their sons, to keep the Sabbath, and cancelled sacrifices at the temple. The faithful fled Jerusalem and hid in forests and caves where they secretly studied Torah and kept Mitzvot. The Jews realized that it was time to revolt against the kingdom of Greece, before, G-d forbid; the Law of Israel was driven from the land. But many lacked the courage to take arms until Matityahu the priest from the house of Hasmonean declared “ Those who are for G-d join me”. Many of the Israelites, charged with the fear of G-d, answered the call, and with Matityahu at their head killed many Hellenists, smashed their temples of idol worship. The Hasmonean rebellion had started. Thanks to a miracle of The Lord blessed be He, a small number of Hasmoneams managed to defeat the numerous Greeks and expel them from the land of Israel. After their great victory, the Jews made a pilgrimage to Jerusalem to renew sacrifices at the temple, which had been stopped for three years. When they arrived at the temple the found that it had been desecrated. Straight away, they set to repairing the damage and purifying the temple so that sacrifices could be renewed. They built a new eternal light in place of the one stolen by Antiochus, but found only one tin of oil that was sealed and uncontaminated. But despite the small amount of oil, the priests lit the lamp and then the great miracle occurred – the oil, which was only enough for one day, lasted for eight days. The Hasmonean kingdom lasted for 103 years until the kingdom of Rome conquered Israel. The Romans appointed Herod as king of the Land of Israel. In his youth, Herod had been an Edomite slave of the house of Hasmonean. Herod took revenge on the Hasmoneans, killing them all. He also had all the sages put to death with the exception of Baba ben Buta, whose life Herod spared so that he would serve as a royal advisor. In his conversations with Baba ben Buta, Herod realized the greatness of the sages of Israel that he had killed and asked the sage how he could make up for his terrible deed. Baba ben Buta told the king that he who had put out the candle of the world - the sages - should deal with the light of the world – the temple. King Herod took Baba ben Buta’s advice and doubled the size of the temple. He built a wall around the mountain giving the Temple Mount the flat shape it has to this very day. To the courtyard of the Temple Mount Herod added grand halls decorated with pillars. The Heichal itself was heightened by forty amot, its outer façade was restored. G-d’s hand could be seen in the building work. The second temple lacked several items that were present in Solomon’s temple – the Ark of the Covenant, (containing both the broken and whole tablets and a torah scroll written by Moses) the Kaporet and the Kruvim which were destroyed by King Yeshayahu after he received a divine revelation that the temple would be destroyed, the Torah scroll written by Moses, a vase containing manna, Aharon’s staff (which miraculously sprouted almond flowers when he was appointed High Priest), the fire from the sky, the divine presence, the holy spirit and the oracle (Urim VeTumim). During the 410 years of Solomon’s temple there were 18 High Priests, but in the second temple over 300 High Priests served during a period of 420 years. The second temple is divided into two periods - 141 years during which the just and righteous High Priests,(served) Shimon the Just, Yochanan the High Priest, Rabbi Ishmael ben Favi and Rabbi Elazar ben Harsom and a period of 279 years in which each High Priest served less than one year. The generation of the first temple was greater than that of the second temple. The generation of the first temple sinned, the temple was destroyed but a second temple was built. The generation of the second temple however, sinned and the temple was destroyed but another temple was not built. Because of unwarranted hatred The second temple and the city of Jerusalem were destroyed because of unwarranted hatred. The Talmud [Gittin 55:] relates the story of two people, one named Kamtza and the other Bar Kamtza. A certain person who liked Kamtza but hated Bar Kamtza was celebrating a festive meal. He instructed his servant to bring Kamtza to join him but the servant, mistakenly, brought Bar Kamtza. The host arrived, saw his enemy Bar Kamtza sitting there and furiously ordered him to leave. Bar Kamtza turned to his host and pleaded: "Let me remain and I'll pay for whatever I'll eat and drink". But the host refused. "I'll pay for half of the entire affair, just let me remain", Bar Kamtza implored. But the host still refused. "I'll pay for the entire affair, just let me remain", he begged. The host steadfastly refused and ordered Bar Kamtza removed. Bar Kamtza decided that, since the Rabbis were present and hadn't defended him, they were also responsible for the humiliation he had suffered. He went and slandered his people to the Caesar claiming that the Jews were rebelling against him. "How can this be proven?” the Caesar asked. "Send a sacrifice to be offered in the Temple and we'll see if it'll be sacrificed", Bar Kamtza responded. The Caesar sent a calf to the Temple but along the way Bar Kamtza slit its lip, causing it to be blemished and disqualified from sacrifice. When the Caesar saw that the priests refused to accept his sacrifice he laid siege on Jerusalem. The siege continued for three years and in the year 70 BCE, Vespasian’s son Titus took over from his father who had been appointed Caesar of Rome. Just after Passover, Titus launched a renewed attack on the city, and even though the defenders were weakened by hunger and three years of fighting, it still took the Roman General two months to breach the walls of the city. This happened on the 17th of the Hebrew month of Tamuz, which to this day is still marked as a fast by Jews. The Romans had to take the city house by house; the Jews fled to the fortress built by King Solomon near the Temple court. When the Romans entered the fortress, the Jews fled from another entrance and set fire to it killing 22,000 Roman soldiers. Finally, the Romans made their way to the Temple Mount and razed the Temple to the ground. This happened on the 9th of Av, the very same day on which the First Temple was destroyed. Rabbi Yochanan ben Zakkai and a few of his disciples were the only ones to survive the destruction of Jerusalem and the Temple. They fled to Yavneh, where they set up a center of Jewish learning from which Torah has gone forth to this day.